Where does the hair come from for hair transplants? Where does donor hair for a transplant come from? One of the most frequently asked questions in our patients’ initial consultation is ‘where does the hair come from for hair transplants?’ When many of us think of a hair transplant we think of a surgeon stitching in some at best ‘similar-looking’ hair among the residing locks and then prescribing a styling routine to finish. The truth is that for an FUE, the donor hair for a transplant comes directly from another area on the same head. So it is not just natural-looking, it is completely natural, authentic and individual hair. FUE hair transplant or Follicular Unit Excision is where individual hair grafts are harvested directly from the donor area, usually a broad area of the back of the scalp where hair loss does not usually occur. How does donor hair for a transplant work? The location of the donor area is chosen to have long-term stability. A circular incision is made in the skin around the upper part of the follicle and it is then extracted (pulled) directly from the scalp, leaving a small open hole. The hair tissue is then grafted finely under a microscope and placed into the destination area, which is the final step in the hair transplant process. A high skill-level in this step is crucial as poor placing can lead to cell trauma and poor graft survival. 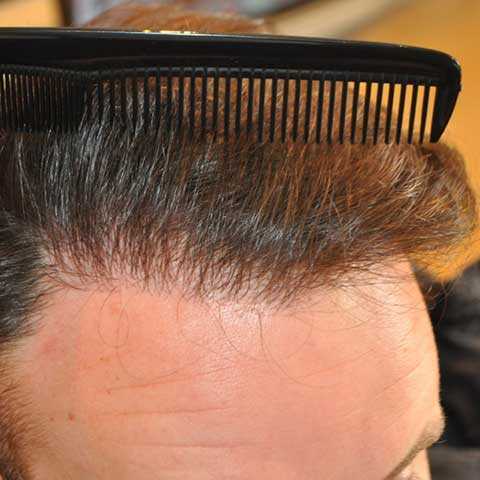 This process is repeated to create as many grafts as are needed to restore hair to the bald area. Donor hair for a transplant: what if there is no hair elsewhere on the head? For some patients (usually male), where complete pattern baldness has occurred, donor hair transplant is not possible since there are no longer any functioning donor sites. However, there is another option for those who have suffered total hair loss (alopecia totalis). If you’re generally happy with a short-haired look or a ‘buzz-cut,’ there is a procedure which can create the appearance of a shaved hair look. This procedure is called Scalp Micropigmentation (SMP) and is easily administered with a trained specialist. This may also be used on clients who have only suffered partial hair loss or to conceal the scar from an FUT transplant. The procedure is essentially very similar to having a tattoo. The pigment, known as a ‘stable chromophore‘ is tattooed into the dermal layer (second layer of the skin which does not shed like the first layer of the skin) using a multi-needled pigment device. Tiny incisions are made into the scalp through which pigment is distributed carefully, dot by dot, over the area affected by hair loss until the whole area is covered. Following a short recovery period, Scalp Micropigmentation creates the look of a shaved head. The Wimpole Clinic specialises in FUE donor hair transplant. Our clients are both men and women of a wide range of ages, ethnicities and hair types. We find FUE donor hair transplant to be the most effective and natural-looking hair restoration procedure and have helped thousands of clients enjoy restored hair growth. If you would like to talk to us about hair transplant, SMP or you have any concerns about your hair loss, get in touch with us now for a free, no-obligation consultation.